On April 15, 2016, the U.S. Department of Education cut off federal student grants and loans to the Skokie, Illinois-based for-profit college chain Computer Systems Institute (CSI), citing detailed evidence of fraudulent conduct. Denying CSI's appeal from its initial January 2016 decision, the Department used unusually harsh language in concluding that CSI gave its accrediting agency, Accrediting Council for Independent Colleges and Schools (ACICS), and the Department, false information about job placements for students. , issued an unusual decision to reconsider ACICS's April suspension of CSI's accreditation. The Department of Education's determinations earlier this year regarding CSI were devastating. Department officials found that some of the fabrications were achieved via a supposed employer called Home Health Consultants (HHC), which CSI reported had hired some 42 of its health care and business career students. Department of Education investigators visited the business address of HHC and found a house with a man named Quinn who stayed behind his closed screen door and offered absurdly unconvincing answers about his operation. The Department investigators also interviewed the supposedly hired students, and most had never heard of Quinn or HHC. Two students did say Quinn had "hired" them -- to hand out flyers on the street to elderly persons "for what the students said were 'bogus medical services," what one student called "lies; tricking old people out of their money." Only one of the two students was paid; she got $100 for more than 80 hours of work. The investigators also visited the address of "Dream Team Hope Health Care Services"(DTH), the supposed employer of 14 other CSI graduates. They found a nearly-empty warehouse and a man with another /www.huffingtonpost.com/davidhalperin/who-owns-the-colleges-the_b_9199072.html"}}">sketchy explanation. Some CSI graduates who were employed were actually working at jobs like cashier at O'Hare airport's McDonalds and as a janitor -- jobs that did not require an expensive (as much as $14,000 a year) CSI degree. The Department of Education's April 15 letter denying the appeal was scathing, indicating that CSI management knew about the misconduct and referring to the sham employers as "grifters." CSI took in $20 million in federal Pell grants and student loans in the 2014-15 award year. 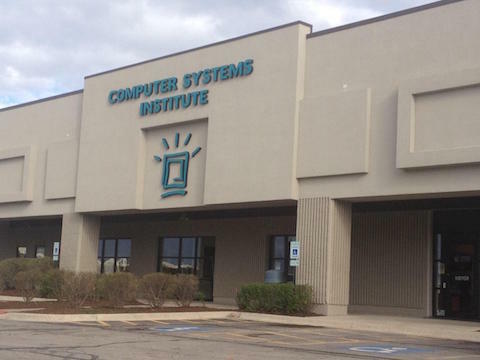 But unlike other for-profit chains, like ITT Tech, that shut down right after losing access to Education Department student aid, CSI is carrying on. And CSI, in fact, opened a brand new campus in Allston, Massachusetts, on September 26.
the Department of Veterans Affairs (VA) has allowed CSI to continue to participate in the GI Bill program despite a clear provision in law requiring disapproval of any institution which engages in misleading practices...Why, nearly eight months after the Department of Education found that CSI engaged in practices prohibited under [this provision], has the Department of Veterans Affairs not used its authority to remove this company from the GI Bill program? More importantly, CSI is also one of the biggest beneficiaries of a U.S. Immigration and Customs Enforcement (ICE) program called the Student and Exchange Visitor Program (SEVP), which allows foreign students to attend higher education programs in the U.S. This July 2016 ICE document shows (p. 17) that CSI, with 3186 students, is the fourth biggest participant in the SEVP program for combined academic and vocational education programs, behind only Cornell University, the Houston Community College System, and the University of Iowa. In fact, CSI primarily markets itself now as a school that provides English language instruction. But without continued accreditation from ACICS, CSI, already stripped of Department of Education aid, would lose its eligibility for the ICE foreign students program. Accreditor ACICS acted in April 2016 to "withdraw accreditation by suspension" with respect to four CSI Illinois campuses. But a statement on CSI's website by CSI's CEO, Julia Lowder, announced that ACICS has now changed course: "On October 3, 2016, the ACICS Review Board of Appeals determined that the ACICS Council must reconsider its withdrawal-suspension action against CSI. I am very pleased with this decision and firmly believe that, when the Council reviews our Institution in December, we will receive a positive action." I called ACICS this morning to confirm that it had taken this action. In response to my call, ACICS posted on its website shortly afterwards an October 3 letter from its interim president, Roger Williams, to Lowder. In it, ACICS notes the decision of the body's Review Board to remand the suspension of CSI, and ACICS directs CSI to hire independent companies to verify CSI's job placements, to assign staff to counsel students on job opportunities, and to explain, given that CSI has "taught out [i.e., closed] all of its 'career-based' programs," what exactly it is teaching at its various campuses and how many students are enrolled in each program. An ACICS source pointed me to the accreditor's July 2016 "Accreditation Criteria" document, available to download on the ACICS website, which explains that the ACICS Review Board consists of "fifteen (15) persons, all of whom have had experience in accreditation." The ACICS source said these individuals are "independent" and not employed by ACICS, but the source declined to tell me who presently serves on the Review Board. The ACICS Review Board decision seems quite stunning. Via that action, the accreditor, with its back to the wall for its lax oversight of predatory for-profit colleges like Corinthian and ITT Tech, and just days after announcing it would pursue a final desperate appeal to Secretary of Education John King to remain eligible for federal aid, halted its decision to suspend a college chain that has been severely criticized by the Department of Education for alleged fraudulent conduct. A Department of Education spokesperson said the Department was aware of the ACICS Review Board action, but that the Department has played no role in ACICS decisions on CSI. Reached by phone earlier today, CSI's CEO Julia Lowder answered my questions thoroughly but declined to be quoted. She said she preferred that I used her written responses to emailed questions, which I provided, with a deadline. She later sought more time, to which I agreed, but that time also has passed. When I get Lowder's responses, I will update. The article contains several statements and claims that are inaccurate, all of which I cannot address in the short time provided. The critical errors, however, are: 1) the suggestion that CSI engaged in fraudulent conduct or that evidence exists of such conduct; 2) the claim that CSI is responsible for the actions of third parties with whom it has no employment or agency relationship; 3) the suggestion that the reason why CSI continues to operate is because of reliance on GI Bill or other federal funding (CSI receives no federal funding); and 4) the inference that ACICS's Review Board in any way acted inappropriately by remanding the original adverse decision to the Council. With respect to your specific questions regarding the ED decision, it goes without saying that CSI strongly disagrees with ED's conclusions and notes that ED based its denial action on claims it made about the accuracy of placement information reported to CSI by two employers of CSI graduates. Note that an independent third-party employment agency randomly selected graduates reported as hired by these employers and verified all the placements. CSI had no relationship with these employers (beyond providing them graduates' referral information as it does for all employers) and did not encourage them to provide incorrect information. They were not agents of CSI and never acted on its behalf. Nevertheless, the actions of those employers were extremely disappointing and CSI has worked and will continue to work with the impacted students (as it does with all students) to try to accomplish their employment goals. We continue to maintain that it was legally unsupportable and fundamentally unfair for ED to attribute the conduct of these third parties to CSI, but the institution is currently focused on maintaining accreditation with ACICS and taking care of current students. As you noted, ACICS has requested certain information, which CSI has provided and will continue to provide on a timely basis. CSI is pleased that the ACICS Review Board has instructed ACICS to reconsider its prior adverse decision. In doing so, the Review Board strictly carried out its obligation consistent with federal recognition law and ACICS accreditation criteria to fairly consider the evidence presented and to provide due process to member institutions. Any suggestion that the Review Board's remand decision is improper or somehow the result of a lack of diligence ignores ACICS's obligations based on accreditation criteria and is simply contrary to the facts. CSI remains worthy of continued accreditation and we hope to have the opportunity to work with ACICS to resolve any open questions regarding compliance with its standards. With respect to your question regarding CSI seeking intervention from ED or other Obama Administration officials regarding ACICS accreditation, we have not sought such intervention and as your article points out, ED had no role in the Review Board's decision to remand. Also note that no CSI students are receiving GI Bill funding. In fact, CSI receives no federal funding.